“For 75% of B2B organizations and 40% of B2C organizations, customer experience management is still an immature capability with a fragmented, uncoordinated approach and no clear leader,” notes Gartner. This fact isn’t lost on corporate leaders, however, as 90 percent of B2B executives agree that customer experience improvement, and a move to customer centric marketing, is a critical strategic activity. According to Salesforce, 74% of business buyers say they’ll pay more for a great experience. Buyers are willing to pay up to 16% more for better customer experiences. But what is the cost of an underwhelming customer experience? Data reveals that it’s not simply a fuzzy nice-to-have to make customers happier. There is a very hard and real cost for CX that doesn’t deliver on customer expectations. Harvard Business School notes that on the larger scale, the three-year average gross margin of a digital leader is 55%, compared to 37% for laggards. That’s an incredibly large impact. One reason this is possible is the simple fact that customers, either in B2B or B2C, are more likely to buy again after having a great experience. Tempkin Group, in surveying 10,000 consumers, found that 86% of buyers who had a great customer experience were likely to repurchase, compared to only 13% of those who received a poor CX. In B2B this number is even more extreme, with 96% of buyers declaring that customer experience directly affects their repurchase decision. 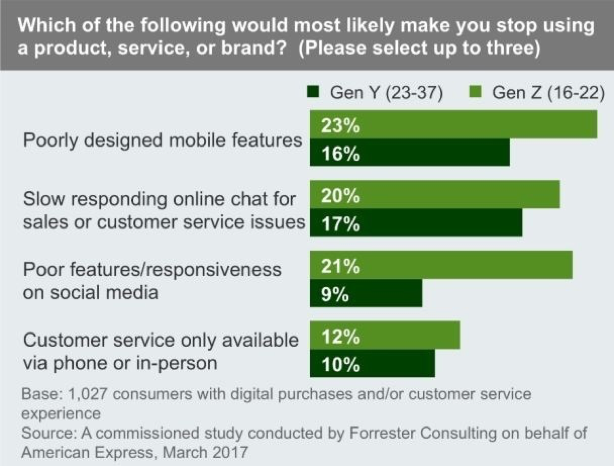 Forrester uncovered some of the key areas where customer experience falls short in the chart below. The problem, it could seem, is that with efforts focused on capturing the first sale, poor CX experiences and a lack of customer centric marketing are eliminating, for many, a repeat purchase. And as the Offer of Consumer Affairs notes, it’s 6-7 times more expensive to attract a new client than to keep one. As online buying continues to increase, it’s critical to make investments now, with digital commerce estimated to account for about half of total B2B revenue within the next two years, according to Accenture. This is a marked rise from 29 percent in 2017. Investing pays dividends. Tempkin Group notes that a moderate improvement in CX would impact the revenue of a typical $1 billion company an average of $775 million over three years, and the Harvard Business Review notes that increasing customer retention rates by 5 percent could increase profits from 25 percent to 95 percent. So what’s the true cost of a poor CX? For many companies, it’s easily millions of dollars. Things aren’t going to get easier in CX, by 2020, Walker Research notes that customers will expect companies to automatically personalize experiences with proactive information. If your CX is already behind and you’re not improving, you’ll be far out of date next year. Thankfully, that’s what we’re here for! If you’d like to discuss how you can get ahead of the curve, you can contact us here.